Meticulously harvested from the finest tea gardens of the world, where only the top two leaves of each bush are hand picked. 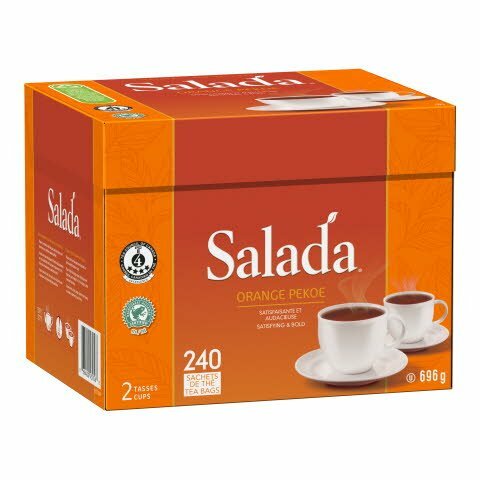 Features the famous flavour and aroma of Salada tea. Salada is approved and recognized by the Tea Council of Canada as a good quality cup of tea. Orange pekoe and pekoe cut black tea. Place one tea bag per serving into a pre-warmed pot or cup. Pour fresh boiling water directly over tea bag. Let steep for 3-5 minutes, then remove tea bag. Serve with milk, sugar, lemon or honey to make a perfect cup of tea. Tea is one of the most widely consumed beverages in the world. Salada’s expert tea tasters artfully blend the freshest and most flavorful tea leaves to create high-quality, great-tasting teas. 100% natural and 100% Rainforest Alliance Certified™ Tea. Packaged in a zero-landfill facility and is a Four Star graded blend by the Tea Association of Canada. To savor the full flavor of our tea, place one tea bag per two servings into a pre-warmed pot or cup. Pour fresh boiling water directly over tea bag. Let steep for 3-5 minutes, then remove tea bag. Serve with milk, sugar, lemon or honey to make the perfect cup of tea.